Travelers passing through Belgium won’t be able to view the Brussels Flower Carpet this year, but locals and tourists can still delight in this year’s Flowertime Festival. Every other year, the Brussels’ Grand-Place is transformed into a spectacular vision of 600,000 finely curated flowers. The botanical puzzle is crafted by more than 100 volunteer gardeners and horticulturists in less than four hours, and the result flourishes for about five days. Travelers passing through Belgium won’t be able to view the Brussels Flower Carpet this year, but locals and tourists can still delight in this year’s Flowertime Festival. The first flower carpet on Brussels’ Grand-Place was created in 1971 by Etienne Stautemas. Stautemas began creating flower carpets in the early 1950s using begonias, which he believed were the strongest and most resilient flowers to work with. He created his first work in his hometown of Zottegem, Belgium, and thus gained the attention of Brussels and major cities throughout Europe. Stautemas’ team went on to create more than 180 massive flower carpets throughout the world, but the Brussels Flower Carpet has remained superior to all. The next Flower Carpet show will occur on August 16 to Augusts 19 of 2018 at the Grand-Place of Belgium. 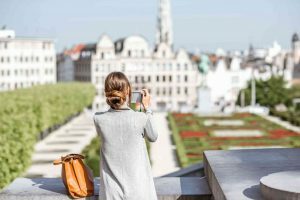 Since tens of thousands of locals and tourists flock to Brussels to view the breathtaking event, it’s recommended that you plan your trip in advance. Hotels and other accommodations book up quickly, and many travelers book their trip a full year in advance. The Flowertime festival is back in Belgium once again! Tourists might have to wait another year to view the flower carpet, but the Grand-Place will still be filled with its fair share of bouquets this August. From August 22 to August 15, travelers and locals can stroll through Brussels and take in the overwhelming display of flowers, fruit, and local art. The major international plant and flower arranging event fills the city with the pleasant smells of thousands of Europe’s most beautiful and vibrant flowers. Smell the roses during the day, and spend your evening relaxing in one of the world’s most beautiful cities. This entry was posted on Wednesday, August 9th, 2017	at 10:14 am	. You can follow any responses to this entry through the RSS 2.0	feed. Both comments and pings are currently closed.